Meatloaf and mashed potatoes. It's what's on sale this week. - mmm-yoso!!! Meatloaf and mashed potatoes. It's what's on sale this week. HI. Back again with another easy meal for two for $5 or less...buying ingredients which are on sale this week. Start out with meat. 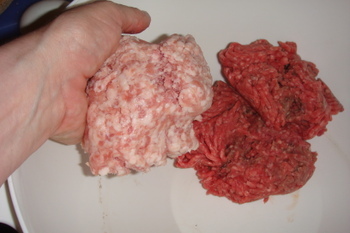 You don't have to, but I mix 3/4 ground beef with 1/4 something else- in this case, ground pork. The 80/20 ground beef is $1.69/lb at Vons this week, the ground pork is always $1.69/lb at 99Ranch. I ask for one of my size handfuls of pork when I go to the butcher counter. Then you need fillers and binders. 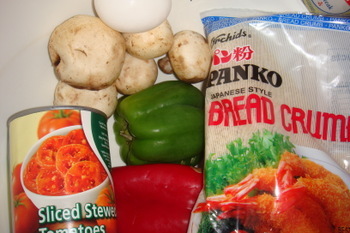 Today, I used an egg, raw mushrooms, stewed tomatoes and panko breadcrumbs. Take the juice from the stewed tomatoes and soak the breadcrumbs in it. Stewed tomatoes have garlic, onion , celery and green pepper in it. No need to add any more flavor. Get an instant read thermometer. That, along with good knives are the kitchen tools you will need and use regularly. The rest of the things for your kitchen should all be multi-use items. 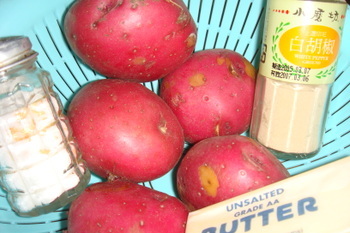 While the meatloaf is baking, assemble the following: potatoes-red skinned, Yukon golds and new potatoes have thin skins that don't have to be peeled. Unsalted butter, salt and white pepper are all else you will need. Nothing fancy. Potatoes are good. Cut the eyes from the potatoes, then chop into relatively small similar sized chinks, so they will cook at the same time. 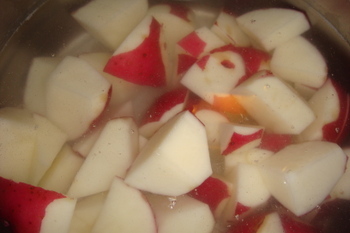 Immerse potatoes into cold water-they were grown underground. (You put vegetables grown above ground into already boiling water). Turn heat on low, let potatoes boil until fork tender. Turn off water and drain-Do Not Rinse! 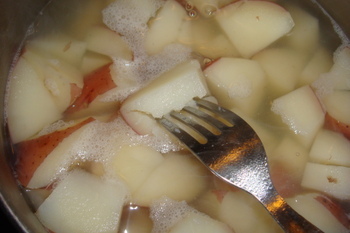 Put the potatoes back into the pot, add the stick of butter, some white pepper and some salt (you can add more after you have a taste). Mash. Taste and see if you need more salt or pepper. I use white pepper so you don't see black specks, plus it tastes kind of nutmeg-gy...you can buy white pepper in any Asian grocery store. 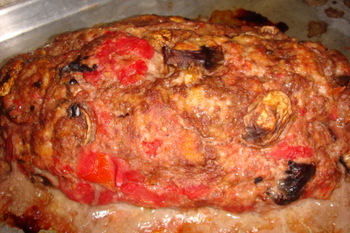 When the meatloaf is done, take it out of the oven and let it rest for about 10 minutes. The juices will stay in that way and the cold leftovers will be wonderful in a sandwich tomorrow. 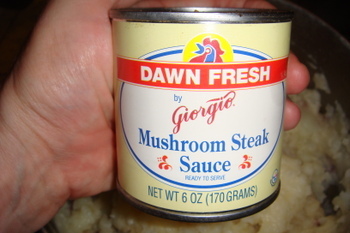 If you want to splurge and really enjoy your meal, (the regular price of this is about $1.49), get this can of Dawn Fresh by Giorgio mushroom steak sauce. SO worth it...just open and heat. Slice the meatloaf, cover with potatoes and gravy. A meal. OK, that was a very general recipe. You can fancy up the meatloaf with all sorts of things, you can fancy up the mashed potatoes, or you can do it this way and not have to think about anything. All the flavors work and you don't even have to add salt. Cook at 350° until internal temperature of 160°is reached. Take out of oven to rest, it will continue cooking. One handful of raw potatoes per person, one stick of butter, salt and white pepper. 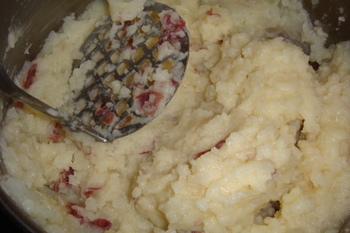 If for some reason there is not enough butter, add some milk sparingly to help mash. This is how I cook. Really. Doggone, you made me hungry. Now I want to do a meatloaf. I really like "process" recipes because that's how I cook. But these days, no need to cook pork to 170. It is safe in the US to eat pork medium rare (or even rare). No trichinosis. Hi Cathy, I just love the label on that can of Mushroom Steak Sauce. Gotta try it one day. Cathy, mmmmmmmm. Rumble rumble. slobber.,slobber. That was my stomach and salivary glands giving your cooking a standing O.
I bet you always get repeat guests at your dinner parties. 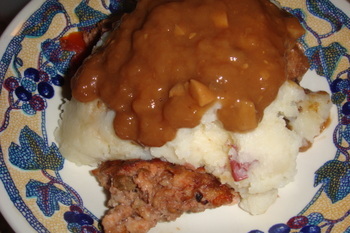 Yum, meatloaf and mashed garlic potatoes is one of our favorites. Now that you've mentioned it, you're right that the Mister has never made the same loaf twice. We've never added mushrooms before but will certainly try that next time! all day and ended up making a variation of it for dinner last night. Best meatloaf I've made in . . . (well can't remember when). Sorry for the mini-rant. Thanks again for the recipe. I'm with you, Ed. I believe pork is safe with an internal temperature at 140 degrees, no trichinosis. But with the variance of thermometers, some recommend 150 degrees. I usually pull the pork off the heat or oven at about 135-140 and then let it rest. That should take care of any nasties. Pork roast is different than ground pork and ground beef in a loaf shape which is different than hamburger shape is all I was trying to stress, ed and Carol...I love rare to medium rare in roasts, steaks and burgers...but not meatloaf. Probably because it is also going to be a leftover/cold meal. Is this mushroom steak sauce available at your ordinary grocery store? Hi Sandy! Vons. Used to have it at Albertsons. Probably still do at Ralphs, (but I haven't been there in a while)... Bottom shelf. Always look at the bottom shelf...or the top shelf- companies pay to have stuff at eye level and the great stuff doesn't have to advertise. Hence my Biscos cookies...sorry not focused...There are wonderful things not at eye level. Cathy - name the date and time! You weren't kidding about the mushroom steak sauce being on the bottom shelf. I found it at a Vons, but it was almost hidden behind one of those wire display baskets in the aisle. I'm thinking of adding fresh mushrooms to this sauce. I just started the deep cleaning for the holidays inside and outside my house, Sandy...perhaps you can be a "test meal"...I would also have sauteed mushrooms (sauteed in butter of course)on the side..but the gravy really can stand on its own. AH-Tina Marie...glad I could be an inspiration for you. Main thing is not to overwork the meat before cooking. Gently blend the ingredients together and let the flavors meld together when they cook. Also, remember you can add spices later...salt, pepper, garlic powder, catsup, chili sauce... But you can't delete thos flavors if you have put in too much...Look on bottom shelves for interesting gravies. Sometimes some cost more and aren't on sale or have a coupon...that is because it doesn't need that incentive. If you ever see "BnB Mushrooms" (in a small blue can)(BnB=Broiled in Butter) get it. hi cathy-- I've begun to make a duxelles of mushrooms after remembering seeing La Julia make it for a dish. So for binders/moisture in meatloaf, I whiz raw mushrooms, some chopped onion, garlic, bell pepper, parsley, pinch of 'Italian Herbs', S&P and a bread crust or two till it's a fine mince. Then I sprinkle this over the meat in a large bowl and mix by hand. The veggies give off their moisture and flavor to the breadcrumbs which also soak up the meat juices. 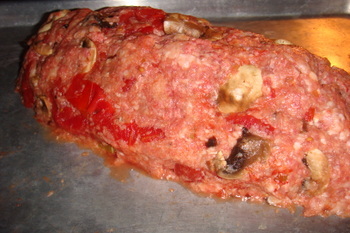 Results in a moist meatloaf. Really like your $5 Fridays. Just great. Hi Teejay (and welcome to the commenting side of the blog). What a great idea. The Mister and I love mushrooms and I had never put them *in*to a meatloaf, just on top. I'll try this (more veggies) next time. I need to get back to the $5 Friday stuff, I suppose I have just been cooking whatever and going wherever because of the holidays.